At the risk of alienating my French and Italian friends, I’m going to go ahead and make a pretty incendiary claim here: among the major wine-exporting nations of Europe, I think it’s fair to say that Spain offers what are arguably the best, most consistently delicious and approachable wines in the budget range. (Sorry, Antoine… no hard feelings, Antoni.) Spain also boasts brilliantly crafted, world-class wines for a few dollars more, but young boozehounds trying to stretch their paychecks (or unemployment checks, or pity checks from Mom) can do extremely well for themselves pouring the rich, classically-styled, relatively inexpensive wines that have made the country a critical darling in recent years. As young winos begin their exploration of Spain, however, the number of regions producing top-quality juice can make the nation seem a bit geographically unapproachable. Because most consumers are relatively unfamiliar with the Spanish regions and aren’t burdened with unfortunate prejudices about which ones are “best” (as is often the case with places like France, Italy, and California), wine merchants have little compunction about promoting the wines they like, whatever the region. As a result, a trip down the Spain aisle might leave you with more questions than answers. Where are Jumilla and Toro and Yecla? What’s the difference between Rueda, Rías Baixas and Ribera del Duero? How’s anybody supposed to differentiate between Cariñena, Catalunya and Calatayud? We could spend full meetings on all of these Spanish regions, and we’ll certainly attempt to do so before we’re too old to be in this organization anymore. For this week, though, we thought we’d start at the top. Spain has only two wine regions denoted as Denominació d’Origen Qualificada, the highest tier, a step above the more prevalent Denominació d’Origen ranking. One of these, Rioja, has been the subject of Winos meetings in the past. The other, to our horror (especially Jason’s, as he’s a big fan of the region), has not — and it’s high time we rectified that. Please join us on Tuesday night to taste some wines from Priorat. 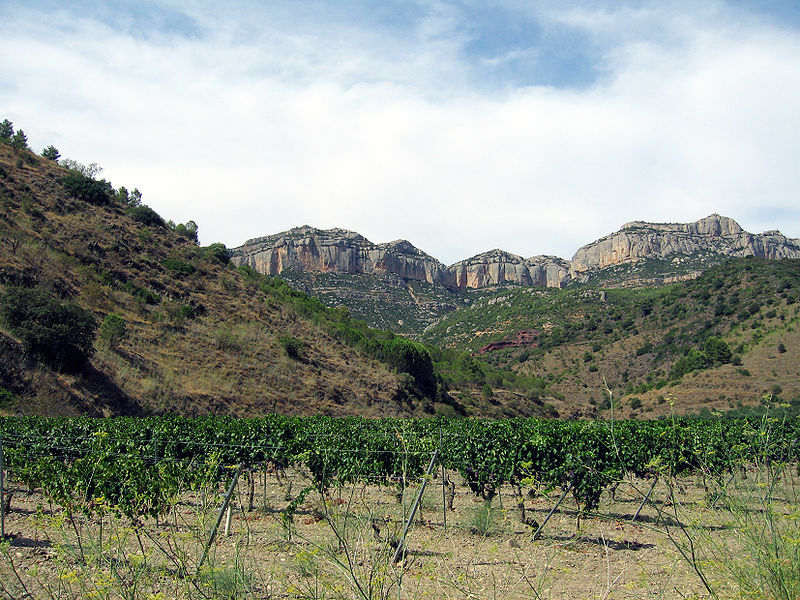 The rocky region of Priorat (or Priorato, depending on whether you prefer the Spanish or the local Catalán), comprises less than 50,000 acres in the northeast of Spain, a couple hours west of Barcelona. It makes white wines and rosés, which are meant to be consumed young, as well as very serious and well-regarded reds, which can age for years. The white grapes planted in Priorat include Grenache Blanc, Macabeo, Pedro Ximenez, and Chenin Blanc, while the reds are made out of Grenache, Garnacha Peluda (literally “hairy Grenache,” so named for its fuzzy leaves), Carignan, Cabernet Sauvignon, Merlot, and Syrah. (Here’s a great website with additional info about the region’s wines.) Priorat is a small area completely surrounded by the larger region of Montsant, which makes wines of similar character, so bottles from that region will be welcome as well. We’ll be meeting at Jason’s place in West LA. The RSVP system functions like this: if you want in, you click on this link and tell me so (don’t forget your full name, e-mail address, and a cute message conveying to me your intentions), and I’ll send you a confirmation e-mail with the address. Once you’ve received your confirmation, go find an interesting bottle of Priorat or a solid bottle of Montsant — or, as always, simply bring ten dollars. Enjoy your newly purposeful trip down the Spain aisle! See you on Tuesday at 8pm.